The Hindu Business Line reported that the Indian sports industry sponsorship surpassed the US$1Billion mark in 2017. Sports in India is gaining lots of attention from the central and state governments and the public. Indian sports sponsorship is on a growth path with the overall sports sponsorship growing by 14% in 2017. Sports advertising rose to 7,300 crores, a substantial leap from 6,400 crores in the previous year crossing the US$ billion dollar mark for the first time in the domestic market. Sponsorship of non-cricketing sports grew in 2017. Football, India’s second-biggest sport by participation and attendance grew by a considerable 64%. India hosted its first ever FIFA U-17 World Cup that became the most attended in the history of the event. Sports is regarded as one of the largest industries globally in terms of employment and revenue. 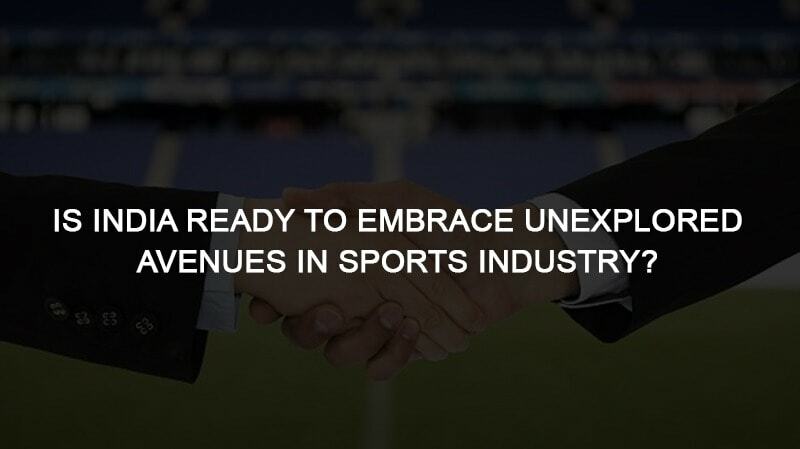 The Business of Sports is a multi-billion dollar global industry driven by enormous consumer demand. The sports business means many different things to different people. This is a truly global industry, and sports stir up deep passion within spectators and players alike in countries across the globe. Sports is destined to be the next big industry in India. In developed countries, sports contribute around 2 to 4% of total employment. A diverse range of professions like athletes, coaches, trainers, event managers, coordinators of sports organizations, public relation officers, program and facility managers, sports equipment and products sales executives, marketing consultants, professional sports promoters, sports event planners and managers, and sports sponsorship specialists can be identified as careers in sports. Novel ventures such as Hockey India League, Indian Super League, Indian Premier League, Indian Badminton League, Pro Kabbadi League, and professionalization of heritage sports events such as Kilithatt, Gotti, Lagori, Gilli Danda, and Gatta Gusthi are changing the outlook of Indian sports. Once, we believed that only cricket would succeed in India. However, the above-mentioned initiatives have shown Indians a world of sports beyond cricket. These initiatives highlight the bright future of sports business in India. The growth and development of the Indian sports industry are creating opportunities for management professionals in a wide variety of settings. Accentuated by initiatives such as the professionalization of heritage sports, commercialization of underdeveloped sports, professional leagues of developed sports, and increased corporate sector investments, sports industry expect a faster growth in a shorter time-span. It has the unique potential to overtake IT and ITES sectors before 2020 in every respect. The job opportunities above-mentioned initiatives created and going to create are tremendous. New sports initiatives require professional human capital to speed up its growth, which is minimal in India now. The government of India takes initiatives to make India a sports superpower. Without professional sports managers, we cannot realize that. The Indian sports industry has an impressive growth prospect even though its fundamentals are unsteady. Only the professional sports managers can bring a solid foundation to India’s sports industry. The sports industry sector in India is nearly a century old and has flourished due to the skill-set of its labour-force. Being labour-intensive in nature, the industry provides employment to 500,000 people approximately. The center of the sports industry in India is around the two states of Uttar Pradesh and Punjab. Meerut in Uttar Pradesh and Jalandhar in Punjab contribute to nearly 75% of total production. Jointly, the two cities accommodate more than 3,000 manufacturing units and 130 exporters. The Indian sports goods industry has a presence in the cities of Chennai, Mumbai, and Kolkata, too although at a lower scale. India’s market-share of the global sports goods export market is expected to grow manifold, with the country establishing the credibility of its goods in the international market. Sports goods made in India are very popular across the world and have made a score in the global sports goods market. The industry exports nearly 60% of its total output to sports-loving people across the globe. The sports goods market in India was valued at US$ 2 billion in 2012-13. The market is growing at 35-40% a year and is expected to reach US$ 30 billion by 2017. The growth is expected because of increasing awareness about health and fitness in the country. India exported sports goods worth around US$ 256 million in 2013-14. India’s sports goods exports grew to US$ 24,383.97 million in January 2018. It registered a growth of about 19% annually. The major items exported during 2013-14 were cricket bats, general exercise equipment, racquets, goal posts, hockey sticks, sports nets, inflatable balls, and protective gears. It is noteworthy that United Kingdom, the land of Sports Engineering, is one of the major importers of Indian sports material. It shows India’s prowess to grow as a superpower in sports.